Roy Lichtenstein’s Nudes referenced 1960s comic book caricatures as opposed to live models to create his female forms. 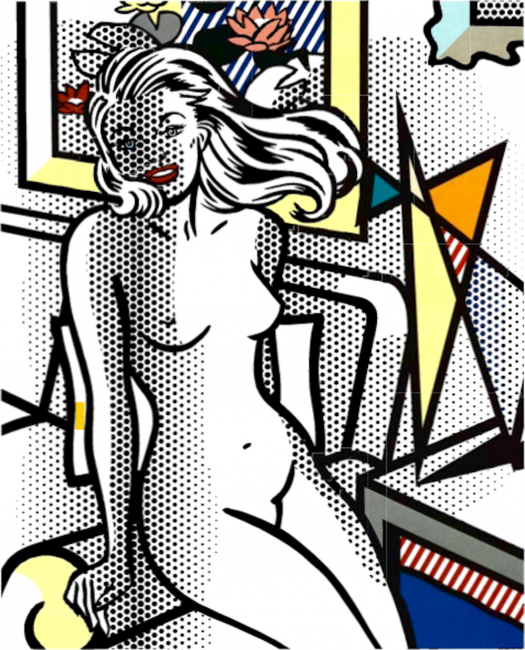 Roy Lichtenstein’s Nudes hold to the strict color palette and two-dimensional pop style characteristic of Roy Lichtenstein, but also works to explore and expand the artist’s compositional technique; contrasting stark geometrical shapes and lines with the curvilinear form of the female body. chtenstein began work on collages for the Nudes series in his New York studio during the spring of 1993. In December of that year he hand-cut the Rubylith stencils for the key (outline) relief plates for each image, and in February 1994 he made his first visit to the workshop for this project. Swan Engraving generated the dots and canvas patterns by computer (for the first time with Lichtenstein’s work), using these to make dye-cut stencils and positive film that could be transferred to the photopolymer for processing and printing. Tyler’s printers hand-cut the stencils for the remaining shapes and stripes. Once processed and mounted onto the base plates, the raised surfaces of these irregularly shaped pieces were inked and then printed using a flatbed offset printing press. Based on ‘love’ and ‘girl’ comic-book illustrations, not live models, these were the artist’s first images of the subject. Soon thereafter he explored the theme in his painting. The series, which consists of six images and three states, also contains iconographic references to others of his earlier works: the Mirrors, Imperfects, Waterlillies, and Interiors.